A while back I wrote the comment above. Since then, I've thought a lot about how flawed most models of good design are. We often talk about product development as a linear process where at each step of the process we provide additional polish, like an assembly line. As you cycle the product through the line (sprints), you're able to tack on a little extra each time. This is not accurate. Products quality doesn't improve block by block. The product is not climbing this imaginary quality ladder. And yet we see models like below. The most common model you see is a translation of Maslov's hierarchy of needs. These models are so popular because they fit typical product development maturation cycles. As the product matures you move up the pyramid. This model is incredibly flawed and damaging to a product team. It makes it so easy to look at the model and say we shouldn't worry about delight because we're still working on the function. That's why you see a lot articles explaining that an MVP should capture a part of every block, such as the modification below. 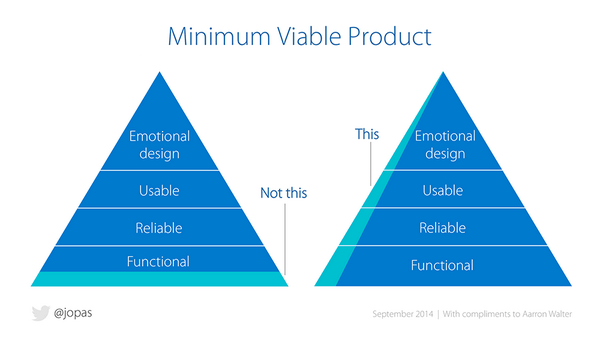 While all these certainly help reframe the inherit misunderstandings of Minimum Viable Product, they lack contextual and practical decision making suggestions. Most importantly, they assume every product should focus on every attribute equally. Every product is different making the most important attributes relative to that price, either through market expectations, competitive advantage, or vision. 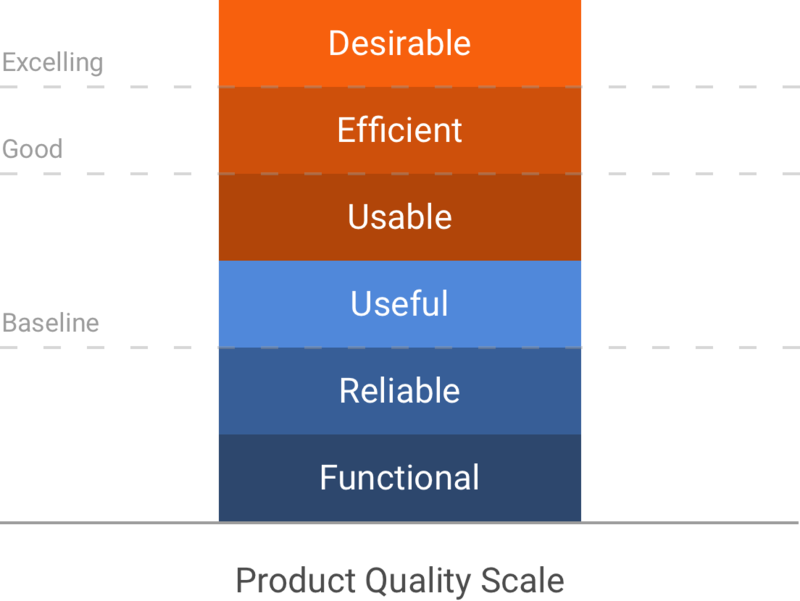 Your product should be an appropriate balance of the attributes that fit your needs. While every products end goal is to excel in every attribute it is not realistic to strive for excellence for all at once, nor is excellence static. The market is always changing what excellence is so it's best to prioritize. Introducing the primary building blocks of an experience. Similar to models discussed above, the following six attributes are, in my opinion, the most basic traits of a product experience. They are equally stacked here but as you'll see later the sizes are flexible. The measure of a product's ability to complete the task it was created to complete. The measure of consistency of the performance of a product, including consistency of speed. "Does it solve real problems?" The measure of a product to provide practical value. "Can the user easily use it?" The measure of how easy to use and learnable a product is for a user to complete a goal. "Can the user use it quickly?" The measure of how quick and with the least amount of effort the user can use the product. Note: The quickest possible way to complete a task can be at odds with usability. Ex. A long step-by-step process can be more usable but less efficient than one long form on a single page, which is less usable but more efficient. "Does it make the user care?" 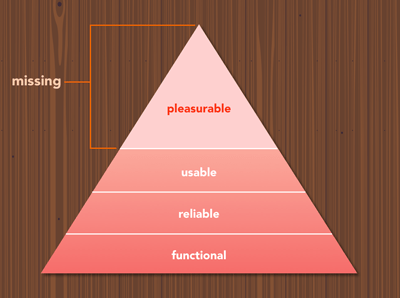 The measure of positive emotions, such as desire and pleasure, that a product brings to the user. Notes: A highly emotive experience can be at odds with usability but interestingly a desirable experience is often viewed as easier to use by the user. Ex. A highly photographic site can distract from the primary action but because it connects to the user on a human level, they are happy about the experience and are more inclined to spend the time to find the primary action. The six core attributes can be organized into two categories, which help establish ownership and how you can best measure them. One of the goals of the pyramid models is to be able to measure where your product's current quality is at- or at least guide you. My proposed model is more flexible but can be used to measure your product's quality or establish a visualization of your prioritization. (3) The product works. If it does not work, there is no product. (1) Is the product receiving user feedback stating that they're receiving errors and unable to complete their tasks? (2) Is your product consistently working but often slow? (3) Does the product work always in the eyes of the user? Is the product always fast and responding within the user's expectations? (1) Does it solve its primary goal? Is there functionality missing that is desired? (2) Is it market leading on how it solves its problem? (3) Does it expand upon its primary goal and effectively solve relevant goals to the primary goal? (0) Do the majority of uses end in failure? (1) Does your product require a substantial learning curve that often requires assistance either from others or documentation? Do users often not know where to begin? (2) Are new users able to complete the primary task but with a high error rate and longer time compared to experienced users? (3) Can any new user use the product to complete the primary task without issue, without assistance, and without excessive way-finding? Is there little difference in task success from a new user versus an experienced user? (0) Is the primary task unnecessarily complicated with dark usability patterns requiring pauses by the user or redoing of actions due to misunderstandings? (1) Does your primary task require optional fields or secondary actions that are not required for the primary task? (2) Does your product attempt to auto-complete or limit user interaction? Are there no optional fields or actions required by the user to complete their primary task? (3) Does your product attempt to predict what the user is going to do? (0) Do users feel like they have to use your product? Does the product lack any brand connection and nothing unique to connect with the user? (1) Do you often receive positive feedback only focused on the usefulness? (2) Do users often speak mostly positive about their experiences with your product, including words on how easy to use it is? (3) Do users often speak very positive about their experiences with your product, including words like love? The scale also works well for describing other aspects of a product. The quality of a product is often a good indicator where the market is. With only changing the labels the scale is a good indicator of market maturity. As the market becomes more mature products compete at the higher attributes. The most mature markets compete within Desirability. There are two key factors that defy these market models. First, market monopolies do not follow this scale because they don't have to compete and often let their product or service languish. Second, market disruption (innovation) redefines a market effectively resetting the market. Be mindful of all attributes and not be stuck focused on one. 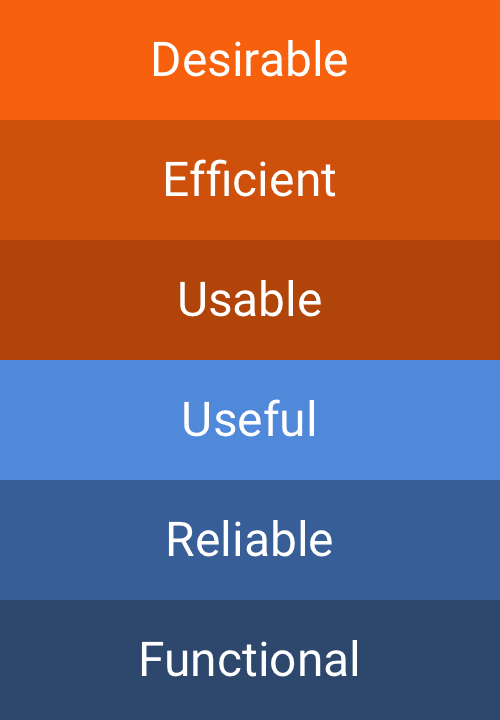 Prioritize the attributes based on what's appropriate for your users and product. Better measure the attributes important to your product by using measurements mentioned, plus by developing your own metrics relevant to your product. Be aware that user expectations change over time. At first, you may get away with only targeting task-focused attributes but soon enough user's demands will far exceed those attributes. "Can the user learn how to use it?" The measurement of a product to enable the user to learn how to use it. The measurement of the ease of use and learnability of a product for as many people as reasonably possible. "Can the user become an expert?" The ability of the user to accomplish more within less time as they spend more time and effort with the product. Note: The functional needs of an expert can be at odds with usability. The added functionality can add complexity to a product that can hinder novice users ability to use it. "How easily can the user reestablish proficiency?" The measurement of how much the user remembers the experience when they return after a period of time. "Does the user associate the product with it being an extension of them?" The measurement of how personally significant a product is to the user. The measurement of how much trust your product establishes with the users. "Does the product communicate a distinct advantage over competition?" The aspect of how much a product has a unique solution compared to competitors. Note: New ways of doing things always require relearning for users. "How much does the product know the user and adapt to them?" The measure of how much the product is adapted to the needs of individual users. Note: A product that changes with its user can disrupt usability due to inconsistency. Aspects of an experience that are not typical for encouraging a great experience and are often counter to the aspects above. They can occasionally be used effectively to create positive user perceptions and lead to a successful product. Often these aspects though cannot be sustained over a long period of time or can't reach mass market. Novelty. A new surface-level way of accomplishing your goal that only intrigues users because of it being new or unusual. As maturity happens, competitors will be looking for novel ways to excite their users. Novelty is only fleeting and has a short window to entice users to use their product. Exclusivity (opposite of inclusivity). The intentional limiting and restricting of users to give a sense of uniqueness or community. Apps like Snapchat make it harder to use and learn to turn people away from the product, making a more private community. Extra Effort (lack of efficiency). When the product gives more things for the user to do and puts effort in-between the user and their goal(s). Sometimes lack of efficiency is used to encourage engagement by leveraging the Effort Heuristic, which can give the user the impression that they're getting more value.